I have always wanted a tipi or wigwam for the kids. I imagined it would be an outdoor one that they would use to shade and play in during the summer months. This winter, however, I’ve found out just how wonderful our Sebra Wigwam Playtent can be when used inside during the cooler weather. I think that every classroom, bedroom and living space needs some form of hideaway- somewhere to have some peace and escape from it all. 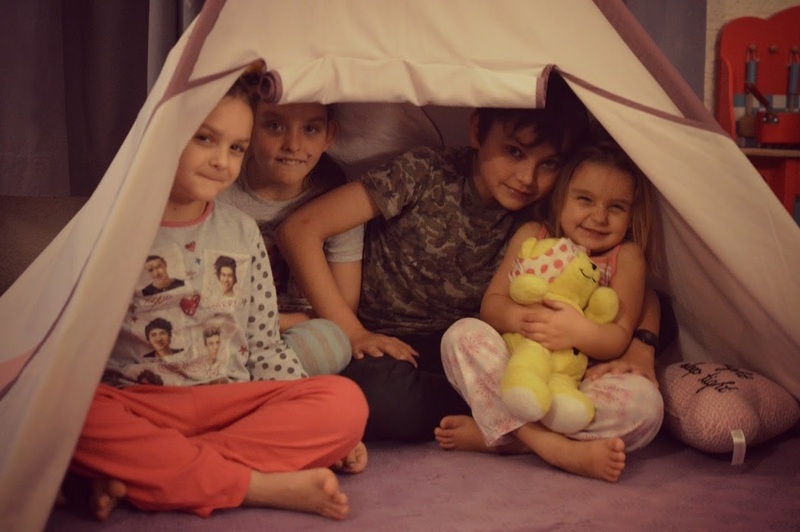 When living in a home with four children and having siblings who share a room, this den element becomes even more important. Our play tent’s permanent home will eventually be in the girl’s bedroom. A private space within a shared room. Whilst the redecoration of their room is still in progress, we have put the wigwam up in the playroom side of our living room. Sometimes a gang of kids go in there and play games and have fun together. They cuddle inside while reading books, listening to music and watching films. It’s a great space to create the cosy Danish concept of hygge. Other times, they make the most of the alone time they can catch in there, sorting puzzles, playing instruments, reading books and day dreaming. They each make it their home by adding bunting, fairy lights, homemade signs, cushions and warm blankets. I love the way it breaks up the space in our house, and makes an extra cosy room. All four can fit in together snugly and it’s a good sized space for each child on their own. Izzy loves being able to fully stand up at the highest point of the wigwam. The tent features a roll up window and also a roll up door. When placed by a window the roll up window makes a great hide to bird watch from. It is really quick to put up and take down and comes with a handy cover to store it in. It would be easy to bring outside on a sunny day and the cover can be easily washed. I can see it being great fun for sleepovers for the littlest ones- they all fell asleep in it the night they tried to stay up and watch Children in Need. It’s so cosy and inviting. Houseology asked us to choose an item from their kids section to review and we chose this playtent. Houseology is filled with stylish brands and beautiful interior products and ideas, I’ll definitely be keeping an eye out for new pieces in the future. The Sebra range appeals to children’s imaginations with good quality Danish design pieces. Previous Post Should I Insure My Boiler?